Leanne Dunic is a Vancouver based multidisciplinary artist, musician and writer. Dunic was born in Canada to parents with Chinese and Croatian ancestry. Dunic’s published writings include poetry, fiction and non-fiction. She was the 2015 winner of the Alice Munro Short Story Contest She has published a couple of chapbooks including Accretion (Onzieme Press, 2012), Swimming Sense (Leaf Press) and Day After Day (Bitterzoet Press, 2014). To Love the Coming End is her first full-length collection. In To Love the Coming End, a disillusioned author obsessed with natural disasters and ‘the curse of 11’ reflects on their own personal earthquake: the loss of a loved one. 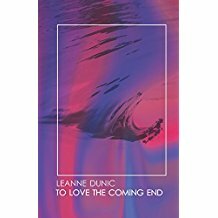 A lyric travelogue that moves between Singapore, Canada, and Japan, this debut from Leanne Dunic captures what it’s like to be united while simultaneously separated from the global experience of trauma, history, and loss that colour our everyday lives.